Ignaz Brüll (7 November 1846 –17 September 1907) was a Moravian-born pianist and composer who lived and worked in Vienna. His operatic compositions included Das goldene Kreuz (The Golden Cross), which became a repertory work for several decades after its first production in 1875, but eventually fell into neglect after being banned by the Nazis because of Brüll's Jewish origins. He also wrote a small corpus of finely crafted works for the concert hall and recitals. Brüll's compositional style was lively but unabashedly conservative, in the vein of Mendelssohn and Schumann. Das goldene Kreuz is a German-language opera by Ignaz Brüll in two acts, with a libretto by Salomon Hermann Mosenthal. It premiered in Berlin in 1875 and was a huge success, later playing on many stages around the world including London and New York City, where it was equally well-received. 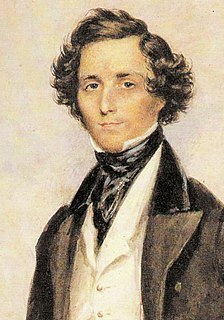 Jakob Ludwig Felix Mendelssohn Bartholdy, born and widely known as Felix Mendelssohn, was a German composer, pianist, organist and conductor of the early Romantic period. Mendelssohn's compositions include symphonies, concertos, piano music and chamber music. His best-known works include his Overture and incidental music for A Midsummer Night's Dream, the Italian Symphony, the Scottish Symphony, the oratorio Elijah, the overture The Hebrides, his mature Violin Concerto, and his String Octet. The melody for the Christmas carol "Hark! The Herald Angels Sing" is also his. Mendelssohn's Songs Without Words are his most famous solo piano compositions. Robert Schumann was a German composer, pianist, and influential music critic. He is widely regarded as one of the greatest composers of the Romantic era. 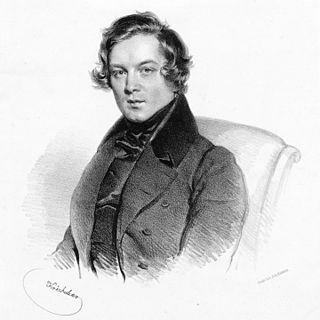 Schumann left the study of law, intending to pursue a career as a virtuoso pianist. His teacher, Friedrich Wieck, a German pianist, had assured him that he could become the finest pianist in Europe, but a hand injury ended this dream. Schumann then focused his musical energies on composing. Brüll was also highly regarded as a sensitive concert pianist. Johannes Brahms regularly wanted Brüll to be his partner in private performances of four-hand piano duet arrangements of his latest works. Indeed, Brüll was a prominent member of Brahms's circle of musical and literary friends, many of whom he and his wife frequently entertained. Johannes Brahms was a German composer, pianist, and conductor of the Romantic period. Born in Hamburg into a Lutheran family, Brahms spent much of his professional life in Vienna, Austria. His reputation and status as a composer are such that he is sometimes grouped with Johann Sebastian Bach and Ludwig van Beethoven as one of the "Three Bs" of music, a comment originally made by the nineteenth-century conductor Hans von Bülow. According to the Grove Dictionary of Music and Musicians, there are two kinds of piano duet: "those for two players at one instrument, and those in which each of the two pianists has an instrument to him- or herself." In American usage the former is often referred to as "piano four hands". Grove notes that the one-piano duet has the larger repertory, but has come to be regarded as a modest, domestic form of music-making by comparison with "the more glamorous two-piano duet". The latter is more often referred to as a piano duo. In recent years, Brüll's concert music has been revived on CD, and well-received recordings are available of his piano concertos, among other non-vocal works. Prostějov is a city in the Olomouc Region of the Czech Republic, in the historical region of Moravia. Today the city is known for its fashion industry and AČR special forces unit 601. skss based there. The historical core of the town has been declared for historical preservation. Nehemiah Brüll was a rabbi and versatile scholar. Julius Epstein was a Croatian Jewish pianist. Johann Rufinatscha was an Austrian composer, theorist and music teacher. Felix Otto Dessoff was a German conductor and composer. Brüll's other operas include: Der Landfriede (Vienna, 1877), Bianca (Dresden, 1879), Königin Mariette (Munich, 1883), Das Steinerne Herz (Prague, 1888), Gringoire (one act, Munich, 1892), and Schach dem König (Munich, 1893). For the ballet, he wrote the orchestral dance-suite Ein Märchen aus der Champagne (1896). For the centenary of Brüll's death in 2007, the Cameo Classics record label and the Brüll Rediscovery Project began a recording programme intended to make Brüll's orchestral works known to a wider audience. His Symphony op. 31 and the Serenade No. 1, op. 29 were recorded by the Belarusian State Symphony Orchestra under Marius Stravinsky. Janet Olney recorded a selection of solo piano works by Brüll (CC9030CD). His Piano Sonata No. 3 was recorded in 2010 by Valentina Seferinova, as was his Serenade No. 2, op. 36 for Orchestra (CC9031CD). In 2011 the Musical Director of the Malta Philharmonic Orchestra, Michael Laus, corrected and completed the score of Brüll's Violin Concerto and recorded the complete work with Ilya Hoffman as soloist (due to multiple errors and gaps in both the score and Brüll's original manuscript, only the slow movement had been previously released). The Macbeth overture was also recorded. All the Cameo Classics recording sessions were filmed, and a documentary on the music of Brüll and his fellow German Jewish Romantic era composers is reported to be in preparation. 1 2 3 4 5 6 7 8 Singer, Isidore; et al., eds. (1901–1906). "Ignaz Brüll". The Jewish Encyclopedia . New York: Funk & Wagnalls. Retrieved 7 May 2012. 1 2 3 4 5 6 7 8 Gorse, Philip S; Olney, Janet (2008–2009). "Brüll Rediscovery Project". www.ignazbrull.com. Retrieved 7 May 2012. ↑ Bollert, Werner (1955). "Ignaz Brüll". Neue Deutsche Biographie 2 (in German). www.deutsche-biographie.de. Retrieved 7 May 2012. 1 2 3 4 5 6 7 8 9 10 11 12 13 Wecker, Hartmut (1998). "The Romantic Piano Concerto, Vol. 20 – Brüll". Hyperion Records . Retrieved 7 May 2012. ↑ Greene, David Mason (1 October 1985). Greene's Biographical Encyclopedia of Composers. Reproducing Piano Roll Fnd. pp. 798–799. ISBN 978-0-385-14278-6 . Retrieved 7 May 2012. ↑ Hubbard, W. L.; Krehbiel, H. E. (30 July 2004). The American History Encyclopedia Of Music: Operas. Kessinger Publishing. pp. 336–. ISBN 978-1-4179-3492-8 . Retrieved 9 May 2012. ↑ "Ignaz Brüll". GrandeMusica. grandemusica.net. Retrieved 9 May 2012. ↑ von Mosenthal; Hermann Salomon (1875). "Das goldene Kreuz". Boosey & Hawkes . Retrieved 8 May 2012. ↑ Upton, George (2005) [First published 1885]. The Standard Operas: Their Plots, Their Music And Their Composers. Kessinger Publishing. pp. 56–58. ISBN 978-1-4179-6970-8 . Retrieved 9 May 2012. ↑ Maitland, John Alexander Fuller (1900). "Ignaz Brüll". In Grove, George. A Dictionary of Music and Musicians (A.D. 1450-1889), Volume 4. London: MacMillan & Co., Ltd. p. 566. Retrieved 9 May 2012. 1 2 3 Elson, Arthur (1904). Modern Composers of Europe. Boston: L. C. Page & Co. pp. 85–86. ISBN 978-0-89341-419-1 . Retrieved 18 May 2012. ↑ Kennedy, Michael, ed. (2007–2012). "Ignaz Brüll". The Oxford Dictionary of Music, 2nd ed. rev . Retrieved 9 May 2012. ↑ Bollert, Werner (16 April 1899). "In the world of music – what the managers, players, singers and composers are doing in various places". New York Times. Retrieved 9 May 2012. ↑ "No. 27456". The London Gazette . 22 July 1902. p. 4669. ↑ Fenech, Gerald (May 1999). "[CD review]". musicweb-international.com. Retrieved 8 May 2012. ↑ Hurwitz, David (8 March 2009). "Brüll: piano works". classicstoday.com. Retrieved 8 May 2012. ↑ Barnett, Rob (December 2009). "[CD review]". musicweb-international.com. Retrieved 8 May 2012. Schwarz, Hermine (1922). Ignaz Brüll und sein Freundeskreis : Erinnerungen an Brüll, Goldmark und Brahms (in German). Vienna: Rikola Verlag. OCLC 7997320. Wecker, Hartmut (1994). Der Epigone, Ignaz Brüll: ein jüdischer Komponist im Wiener Brahms-Kreis (in German). Pfaffenweiler: Centaurus-Verlagsgesellschaft. ISBN 978-3-89085-919-4. Artur Schnabel was an Austrian classical pianist, composer, and teacher. Schnabel was known for his intellectual seriousness as a musician, avoiding pure technical bravura. Among the 20th century's most respected and important pianists, his playing displayed marked vitality, profundity and spirituality in the Austro-German classics, particularly the works of Beethoven and Schubert. Alfred Brendel KBE is an Austrian pianist, poet and author, known particularly for his performances of Mozart, Schubert, Schoenberg, and especially Beethoven. 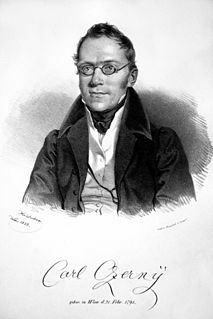 Carl Czerny was an Austrian composer, teacher, and pianist of Czech origin whose vast musical production amounted to over a thousand works. His books of studies for the piano are still widely used in piano teaching. Dinu Constantin Lipatti was a Romanian classical pianist and composer whose career was cut short by his death from causes related to Hodgkin's disease at age 33. He was elected posthumously to the Romanian Academy. Robert Fuchs was an Austrian composer and music teacher. As Professor of music theory at the Vienna Conservatory, Fuchs taught many notable composers, while he was himself a highly regarded composer in his lifetime. Theodor Hermann Leschetizky was a Polish pianist, professor and composer born in Łańcut, then Landshut in the kingdom of Galicia and Lodomeria, also known as Austrian Poland, a crownland of the Habsburg Monarchy. Ernő Dohnányi was a Hungarian composer, pianist and conductor. He used a German form of his name, Ernst von Dohnányi, on most of his published compositions. The "von" implies nobility, and, according to the biography by his third wife, his family was ennobled in 1697 and given a family crest, which she describes in some detail. Ignaz Friedman was a Polish pianist and composer. Critics and colleagues alike placed him among the supreme piano virtuosi of his day, alongside Leopold Godowsky, Moriz Rosenthal, Josef Hofmann and Josef Lhévinne. Salomon Jadassohn was a German pianist, composer and a renowned teacher of piano and composition at the Leipzig Conservatory. Daniel Gottlieb Steibelt was a German born pianist and composer who died in Saint Petersburg, Russia. His main works were composed in Paris and in London. Robert Kahn was a German composer, pianist, and music teacher. Avner Dorman is an Israeli-born composer and conductor. Karl Aage Rasmussen is a Danish composer and writer. Anton Urspruch was a German composer and pedagogue who belonged to the late German Romantic era. Robert Fischhof was an Austrian pianist, composer, and professor at the Vienna Music Conservatoire.